A look at how video can be used to enhance teaching and learning. Video can be both powerful and engaging when used within teaching, and it enriches learning materials. Recent developments in the technologies used for the capture and delivery of video have had a significant impact on the use of video within teaching, making it easier than ever to implement. Videos have become an effective tool in the flipped classroom, allowing staff and students more valuable time in the classroom to concentrate on deeper learning activities, whilst enabling students to further their learning by using videos for self-directed study. At Plymouth University, staff are using video in a variety of interesting ways, as part of their teaching practice. These include: creating small learning resources to embed in Moodle; creating a series of videos to enhance lectures; and providing a resource for revision. 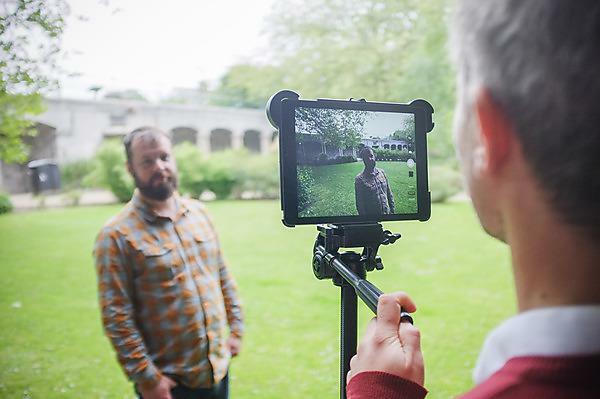 We continually observe new and engaging approaches to using video within the sector, and are always keen to advise and assist staff with incorporating these into their practice. Furthermore, an emerging method of student assessment involves students creating videos as part of their assignments, with the added advantage of being able to submit their video directly to Moodle via a media eSubmission. There are many tools and support resources available to staff who wish to learn about using video. The University is also fortunate to have full access to Lynda.com, which contains an extensive suite of training videos related to video editing software and other video techniques. The recent introduction of the Panopto content capture system at the University has meant that video in teaching has become a fundamental part of the overall student learning experience. Download our 'Video for teaching and learning' guide. At ASTI we run a hands-on ‘Using Video in Teaching’ practical workshop, which guides staff through the fundamentals of creating a video project, from storyboarding to creating video content, and editing. The workshop also includes case studies from staff and students at the University, to show how video has been embedded within teaching, what the pedagogic benefits have been to learning, and its overall impact. Additionally, there is an evolving online resource, created by ASTI, which contains lots of tips and tricks on video creation, (including a full Lynda.com playlist on video creation) and some examples of how it is being used at Plymouth University. Dr Roy Lowry created a series of podcasts for his students and used flipped classroom pedagogy, to supplement and enhance the practical laboratories. By creating simple podcasts, students were briefed of the expectations and set up requirements of a practical laboratory, allowing more time for in-depth learning and exploration in the physical laboratory. As a result, the students were more confident and prepared, and aware of the experiments and equipment, and they used the videos as a study and revision aid after the practical sessions. Professor Geoff Skates uses video as an inclusive method of assessment within multidisciplinary engineering design modules. Small teams of students are tasked with creating a marketing video to demonstrate and showcase their research and final design concepts, and to sell their projects to potential investors. Using videos that incorporate 3D CAD and Virtual Reality walkthroughs, gives students a set of transferrable skills appropriate for the workplace, and produces innovative and content rich assessments. By creating these videos, the students demonstrate their work in a more engaging and dynamic way and in turn develop their own digital literacies.